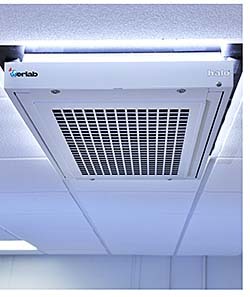 Halo is an air change alternative that provides reduction of air change rates while simultaneously improving lab air quality. Neutrodine filtration technology captures and retains a broad range of acids, bases and solvents. Installs in the ceiling grid. Onboard LED lighting emits a constant "halo," which will pulse to communicate the detection and capture of fugitive emissions.